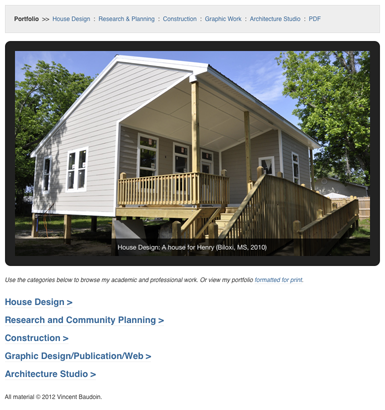 The front page of the new digital portfolio displays a rotating set of images and links to the five broad categories of work. I’ve been busy applying to graduate schools lately, and that has prompted me to work on revising and updating my portfolio. In addition to my traditional portfolio, I’ve been working to organize and document my work on the web, and the results can be found in the ‘Portfolio’ section of this website. Digital portfolios offer a means to display a much broader and deeper array of work, with no limit to the amount of content and a variety of formats available. However, working within the WordPress.com structure, I have kept the design fairly straightforward and uncluttered. I’m aiming for a presentation that is simple, intuitive, and attractive. The portfolio is organized into five broad categories: House Design, Research & Planning, Construction, Graphic Work, and Architecture Studio. The whole thing is still a work in progress, so expect some broken links and incomplete pages. I welcome any comments or suggestions about the organization and appearance. Thanks for taking a look!